The wizards represent all that the true “muggle” most fears: They are plainly outcasts and comfortable with being so. Nothing is more unnerving to the truly conventional than the unashamed misfit! I absolutely did not start writing these books to encourage any child into witchcraft. … I’m laughing slightly because to me, the idea is absurd. I have met thousands of children now, and not even one time has a child come up to me and said, “Ms. Rowling, I’m so glad I’ve read these books because now I want to be a witch.” They see it for what it is… It is a fantasy world and they understand that completely. I imagined being a famous writer would be like being like Jane Austen. Being able to sit at home in the parsonage and your books would be very famous and occasionally you would correspond with the Prince of Wales’s secretary. You know I didn’t think they’d rake through my bins, I didn’t expect to be photographed on the beach through long lenses. I never dreamt it would impact my daughter’s life negatively, which at times it has. J.K. Rowling, Interview with Jeremy Paxman, Newsnight, 2003. J.K. Rowling, Harvard Commencement Address, 2008. 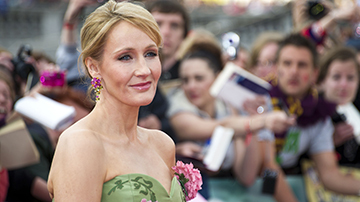 Joanne “Jo” Rowling, (born 31 July 1965), pen names J. K. Rowling and Robert Galbraith, is a British novelist best known as the author of the Harry Potter fantasy series. The books have gained worldwide attention, won multiple awards, and sold more than 400 million copies. They have become the best-selling book series in history and been the basis for a series of films which became the highest-grossing film series in history. Rowling had overall approval on the scripts and maintained creative control by serving as a producer on the final installment. J.K. Rowling is a Creative. J.K. Rowling is a Visionary. J.K. Rowling is an Intellectual. [ptfeed feed_id=”22422″ sort_by=”-1″ num_results=”15″ columns_count=”3″ image_size=”custom_max” max_width_images=”300″ image_align=”center” show_photos=”1″ ok_resize_previews=”1″ show_links=”1″ remove_duplicates=”1″ mix_defaults=”1″ show_date=”1″ cache_interval=”60″ ]j.k. rowling around the web[/ptfeed]Click edit button to change this text.